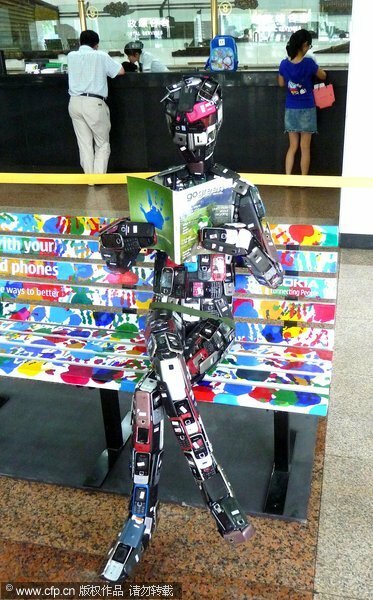 A robot made from used mobile phone shells sits reading a book on a colorful bench in a post shop in Beijing, July 13, 2011. A newly released Georgia investigation shows rampant, systematic cheating on test scores in Atlanta’s public schools, ending two years of increasing skepticism over remarkable improvements touted by school leaders, The New York Times reports. The results of the investigation showed the cheating occurred at 44 schools and involved at least 178 teachers and principals, almost half of whom have confessed. A culture of fear, intimidation, and retaliation existed in the district, which led to a conspiracy of silence, according to Gov. Nathan Deal. “There will be consequences,” he added, which will certainly include dismissals. The findings of the investigation will be delivered to district attorneys in three counties where cheating most likely took place. At the center of the scandal is former Superintendent Beverly Hall, named the 2009 National Superintendent of the Year and considered one of the nation’s best at running large, urban districts. She took over the Atlanta district in 1999 with broad support; the investigation shows cheating on the state-mandated Criterion-Referenced Competency Test began as early as 2001, and that “clear and significant” warnings were raised as early as December 2005. Dr. Hall’s administration punished whistle-blowers, hid or manipulated information, and illegally altered documents related to the tests, the investigation found. The state launched investigations into test-cheating in Atlanta Public Schools after The Atlanta Journal-Constitution published analyses in 2008 and 2009 that found suspiciously high gains on the state Criterion-Referenced Competency Test. State education officials’ examination of erasures on answer sheets found suspicious numbers of wrong-to-right corrections on the 2009 CRCT in 58 Atlanta schools, far more than in any other Georgia district. The Atlanta district’s own review – performed by a panel that came to be known as the Blue Ribbon Commission – suggested that cheating was concentrated in just 12 of the 58 schools. But a criminal inquiry, the results of which were released Tuesday, documented evidence of widespread cheating. Click on one of the icons on the map or one of the school names below to view more information about each school. Roll over the icon for a summary. View the original analysis and retest scores at ajc.com. Facebook and Google facial recognition software watching everything you do for the past 20 years and the internet never forgets!